When you're a full time working mum (FTWM), every moment that you have alone with your kids is special. It's just them and me; they get my full attention (well almost, when I'm not on social media *laughs*) and I get to be the only one they can turn to (no matter how much they don't like mama's discipline, there ain't daddy or grandma to run for help *laughs*)! 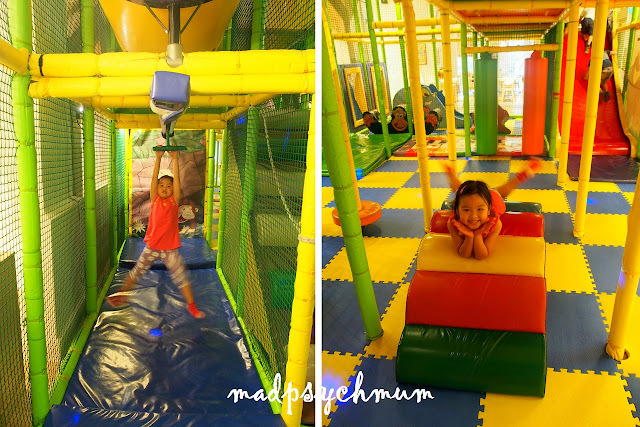 So since the grandma was busy with her house renovations one Friday and my girl had no school because her teachers were on training, I decided to bring the kids to check out the newly renovated Go-Go Bambini located at Dempsey Hill. It's definitely a must to drive or get a cab to get here; I'm thankful that I have MINIbee (my yellow MINI Cooper). I'm no stranger to Go-Go Bambini, having been there twice before a new management took over recently. It would be good to see the improvements that the new management has done to the place to spruce it up. Each parent is given a card which is like your "credit card" in the playground. You use it to swipe for everything such as your child's entry fees and food at the cafe. You'll pay only when you leave. After we had entered, we passed the familiar play structure, which looks the same as before. The new management has extended the ceiling and added new air-conditioners so that the air circulation is not stuffy as before. 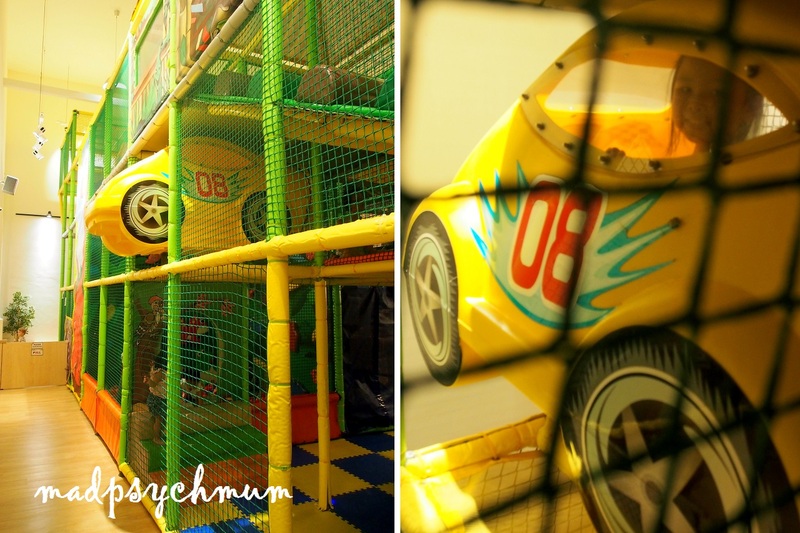 The new Go-Go Bambini does not allow shoes on their premise except for the main walkway to the Shoe Cubby and the toilets (as opposed to the past where shoes are only not allowed in the play structure itself but ok everywhere else). This is to ensure that the premise is kept clean for the comfort of all their guests. 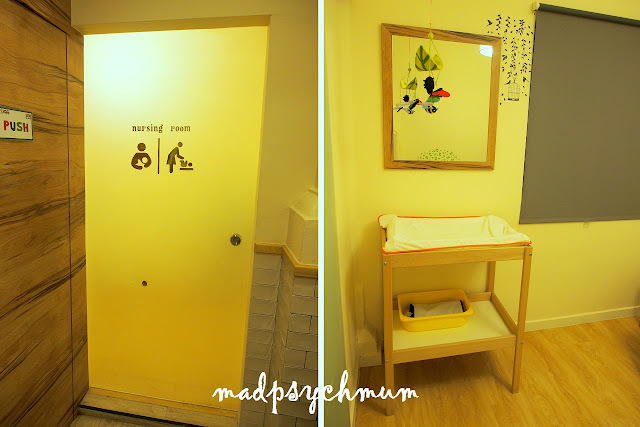 For those of you who want to nurse or change your baby's diapers, you'll be happy to know that there is a nursing room next to the toilets. Generous size sofa for nursing, with an electrical point for those of you who express. It's a MUST for everyone to wear socks so don't forget to bring your socks! Shoes kept, socks worn and ready to play!! And off they ran to the playground, leaving me with plenty of time to explore the rest of the place. 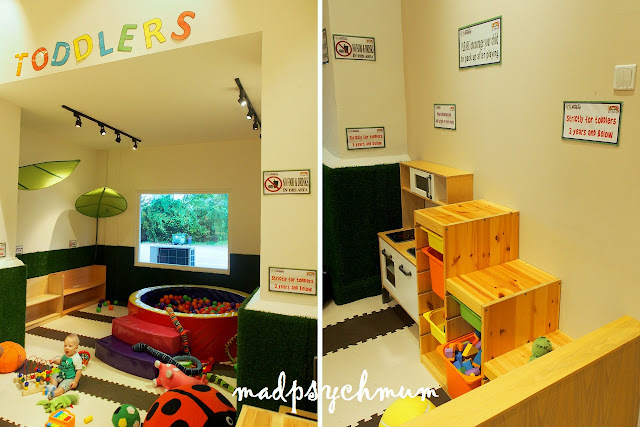 The new management is also owners of the preschool Pink Tower Montessori and hence opened an outlet of their preschool next door. 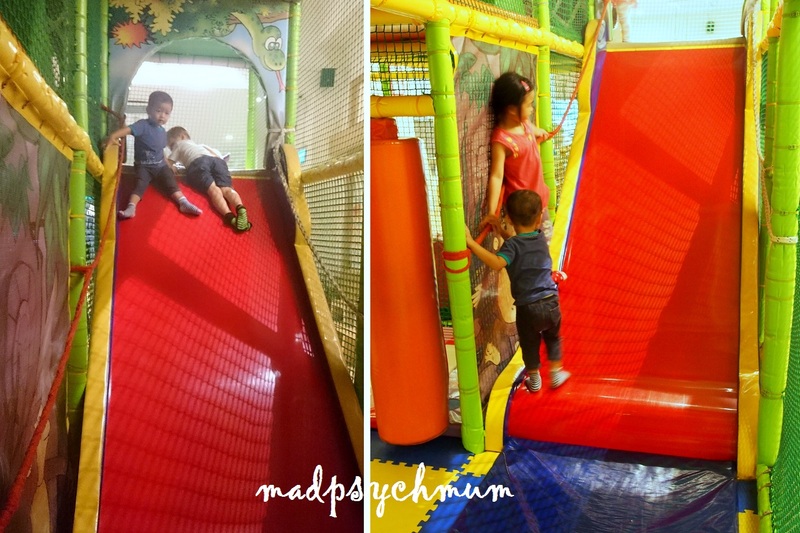 There's also an outdoor playground that's opened to both the preschoolers and the Go-Go Bambini guests but very few kids played there because the indoor playground was enough (for my kids at least). I went back inside to check on my kids and they were already in the middle of the play structure. The play structure is completely padded so I didn't feel the need to follow my 2- and 5.5-year-old every where, unlike when we're at most outdoor playgrounds. It helps that the younger one has his older sister to take care of him too. Climbing up, down, in and out! My girl is a born poser. Initially the kids were afraid to slide down this slide. They soon got over it and loved it so much, I think Baby Boy went down the slide more than 20 times. Right: Step piano for you to make music with your feet. And then there was the favourite ball pit! Gotta have this in every indoor playground! 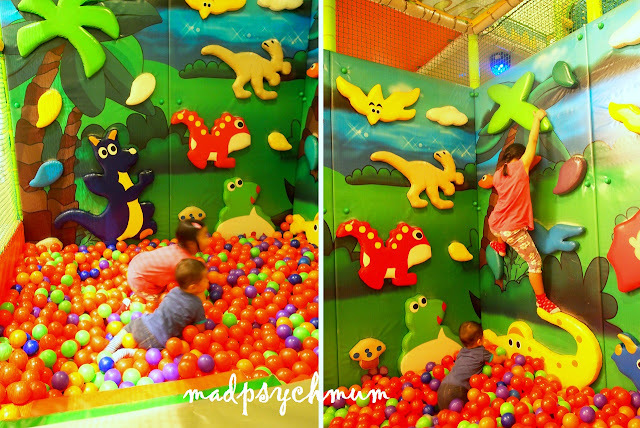 There are climbing structures in the ball pit too, which made the girl a little more confident to climb, knowing that she wouldn't hurt herself too badly if she fell (into the ball pit). 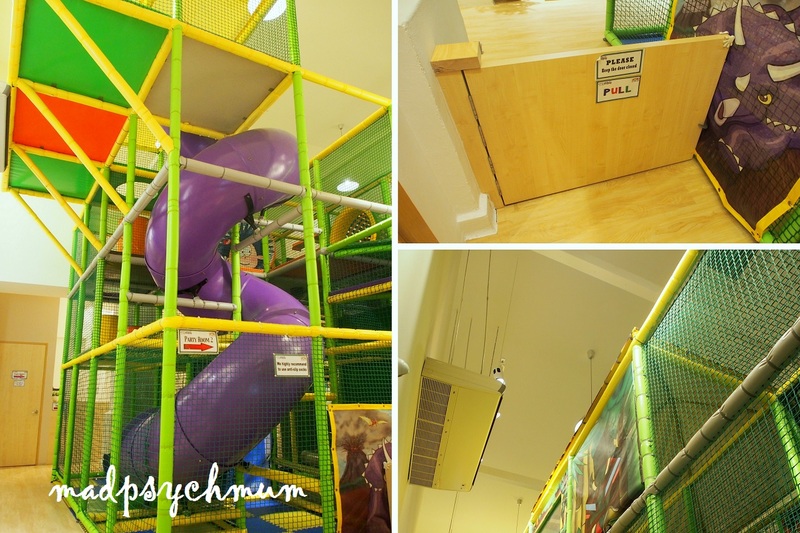 There's another toddler area in the play structure, which did not change from the previous arrangement except that the ball pit has been shifted to the other toddler corner (see above). My kids enjoyed running in and out of this area but that's about it. The slide was too easy for my boy. As you can see, my boy loves to follow his sister everywhere she went, which meant that I could sit back and relax in the cafe. The staff told me that they no longer allow walk-ins for the safety for the kids. Only patrons of Go-Go Bambini will be allowed to dine at their cafe. I won't say that the prices are cheap but for the price you pay, you get decent quality and portion. I ordered a chocolate smoothie, apple juice, Eggs Benny and pasta for me and the kids. One was done just right, the other was slightly overdone. 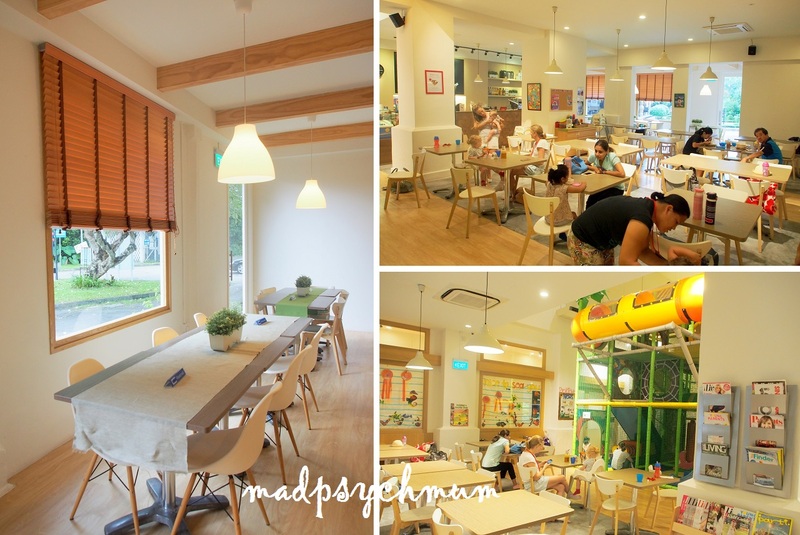 For an indoor playground, the food was not too bad. My girl finished more than half of her pasta. My boy however, had nothing to eat as he prefers Asian food (like noodles etc) and the menu was mostly western. I think my favourite change is the air-conditioning! I distinctively remember that it used to be so stuffy in the past. Now the air-conditioning is so good that I can enjoy catching up on my blogging in the cafe while the kids played. 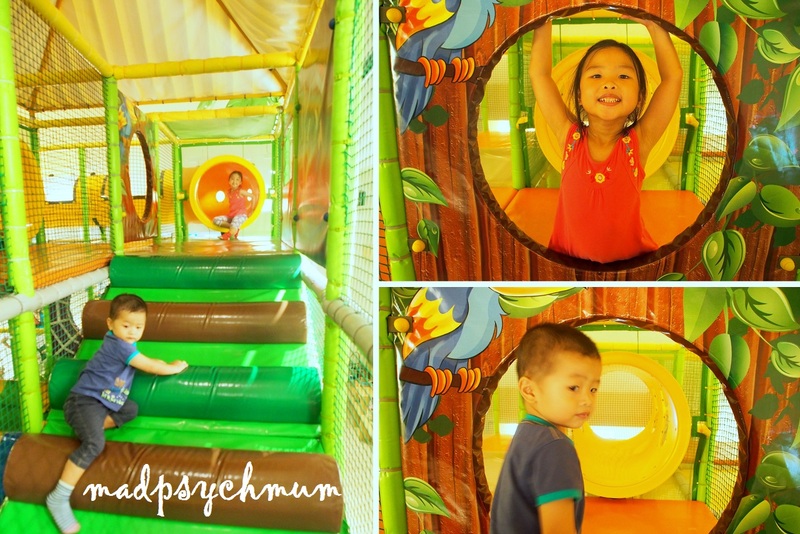 Unlimited Playtime from Mondays to Thursdays (excluding Public Holidays). 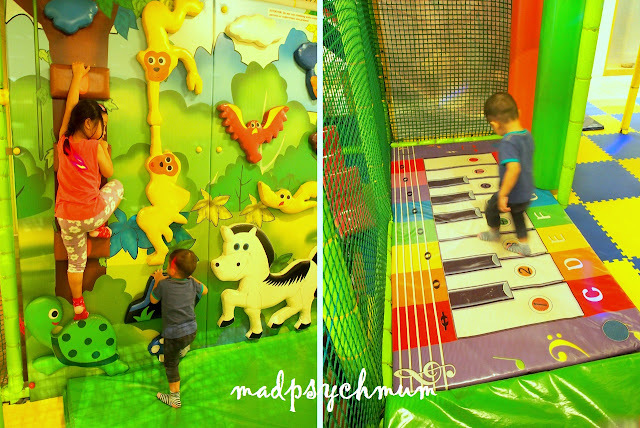 2 hours Playtime on Fridays, Saturdays, Sundays and Public Holidays ($5 per subsequent half hour or part thereof). Membership is priced at $89+ per year, inclusive of 3 Free Plays and 10% discount at the cafe and on party bookings. If you live nearby and have a car (free parking! ), definitely worth to get the membership. 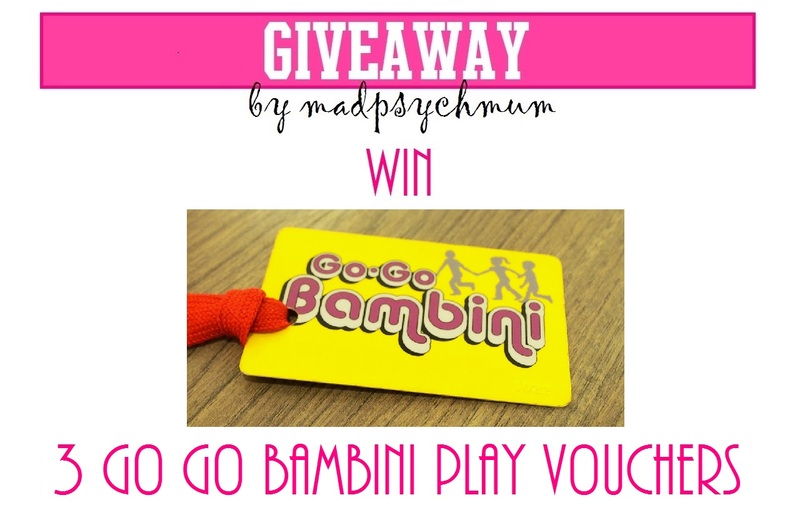 We are giving away THREE 2-Hour Play Admission Vouchers (each voucher admits 1 child) to Go-Go Bambini to ONE lucky winner! 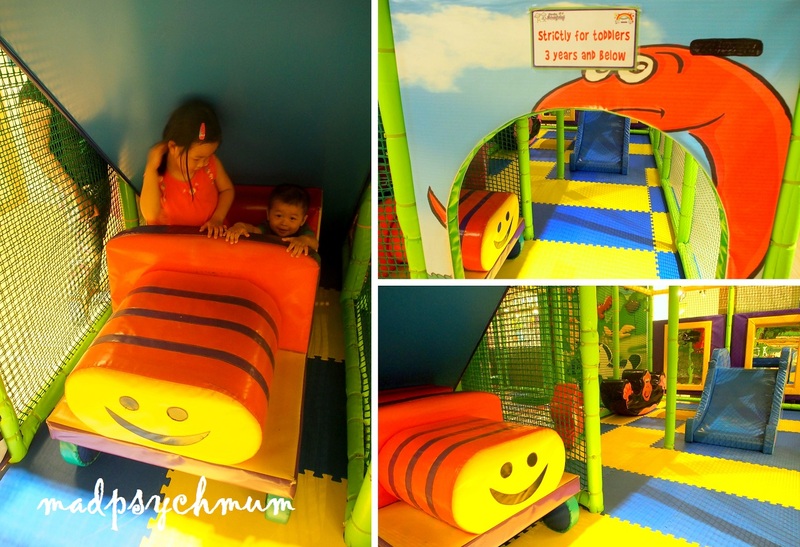 (1) Leave a comment on this blog post with the answer to this question: Based on my Fun in Singapore Guide, how many water playgrounds has my girl visited? Note that in order to be fair to all participants, your comment will only be visible at the end of the giveaway period. (Don't forget to do this as we'll be using the widget to pick the winner!). (3) Include your email address so that we can contact you. a) This giveaway ends on 10th June 2016 (Fri) and is only open to readers living in Singapore. b) Accounts created solely for the purposes of entering giveaways will automatically be disqualified without notice. This will also apply to those who do not fulfill the conditions of this giveaway. c) Winners will be drawn randomly via Rafflecopter and contacted by me. d) The winner must respond within 3 days otherwise another winner will be drawn. The winner must provide me with a mailing address for me to mail the vouchers via normal mail (note that I will not be responsible for lost mail). e) The vouchers in this giveaway will expire on 31st August 2016. Disclosure: Complimentary plays and membership were received from Go Go Bambini Singapore for the purposes of this review and giveaway. No monetary compensation was received; all opinions are my own.